The sun finally shone on Glastonbury again, bringing a broad smile to the faces and performers alike. £150,000 was still spent on downpour precautions. 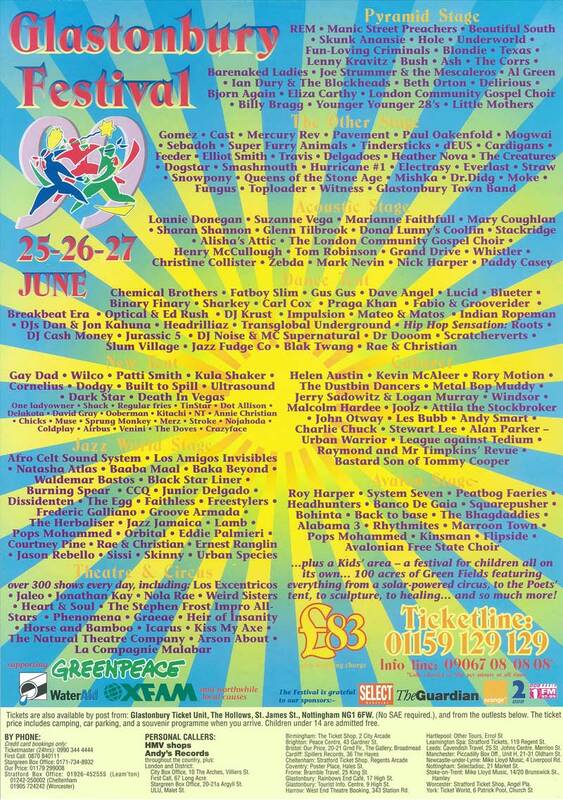 The widest range of entertainment ever was on offer, with over 300 bands, a kaleidoscope of theatre, comedy and cultural adventures, and more than 250 food stalls – all publicised on a buzzing Glasto web site and broadcast on BBC2. Greenpeace, Water Aid and Oxfam again benefitted. This year’s event was sadly overshadowed by the death of organiser Michael Eavis’s wife Jean. A winged wicker sculpture was ceremonially burned in her honour, whilst fireworks erupted into a moonlit sky. Acts included REM, Manic Street Preachers, Fatboy Slim, Hole, Blondie, Al Green, Skunk Anansie, Lonnie Donegan, Marianne Faithful and Courtney Pine. Attendance: 100,500. Tickets £83 including programme.